There's nothing in the world quite like a nice hot homemade breakfast. The season doesn't even matter. Whether winter, spring, summer or fall, comfort food for breakfast has no equal. That's why I love making homemade buttermilk pancakes. You can't go wrong with a nice warm pancake after hard work on the homestead in the morning. Not only that, but being able to use your own ingredients from around the homestead like eggs and topping off those buttermilk pancakes with homemade yogurt or strawberry jam! Nothing in the world can compete. 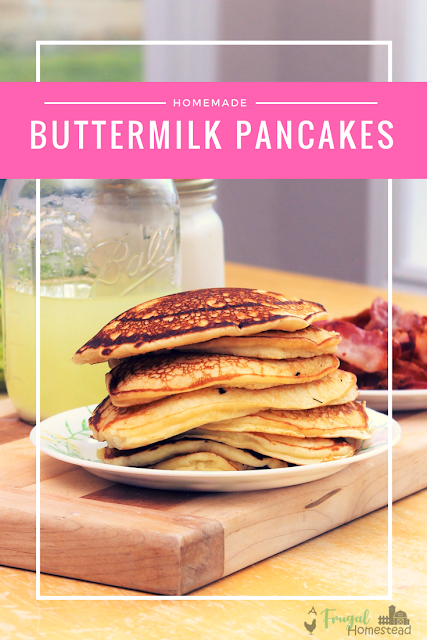 I typically will make my homemade buttermilk pancakes with the whey I get from our homemade yogurt recipe. This is just the leftover whey that drips off after we strain the yogurt. But you can just as easily purchase buttermilk from the grocery store and have the same yummy pancakes. Simply top off these yummy pancakes with some fresh fruit from the berry patch or off the peach tree it it is almost like you are eating dessert for breakfast. Serve with a nice side of thick cut bacon and you've got yourself a gourmet homestead meal. The best part? You can freeze any leftover pancakes for use later. (Not that we usually have many leftover.) Simply pop a frozen pancake into the toaster and you'll have a quick, healthy and homemade meal in a matter of minutes. You can always double the recipe to make extra pancakes to freeze. My kids love them and they are perfect for the summer when things get a bit more busy on the homestead. Combine buttermilk and eggs and whisk. Add 2 Tbsp butter. Set aside remaining tablespoon of butter. Heat skillet or griddle at about 350 degrees. Add butter. Use a 1/2 c. dry measuring cup to ladle batter onto griddle. Cook until the top of the pancake has bubbles and the sides become slightly firm, then flip. Cook until golden brown.